I'm both laughing and weeping because this has been an emotional time. All of you have done so well in this class and have made me so proud. Now it's time for the final lesson. It's bittersweet because I enjoyed teaching the class, then watching you take my basic instructions and turning them into masterpieces. Before I forget, I can no longer see any links, including AEDM, which means I can no longer link to Creative Every Day. Also, I cannot leave comments on any Blogger blog with embedded text. If you aren't sure what "embedded" is, simply scroll to the end of this post and see what I'm talking about, and how to change your comments. Back in February, I showed these photos during WOYWW of some of my altered book covers. 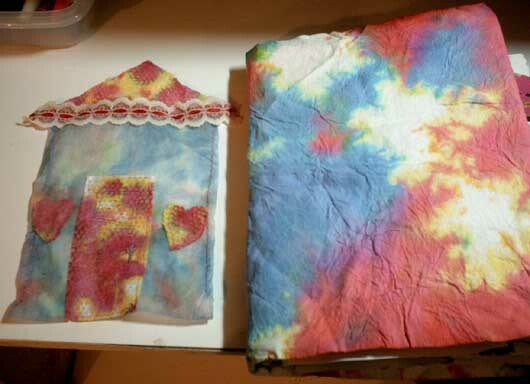 When your altered book is not complete, it helps to keep it as flat as possible. For my Coffee AB, which is not finished, I covered it with a bag from Mexico that originally had coffee beans in it. I wasn't crazy about the coffee, but loved the bag. 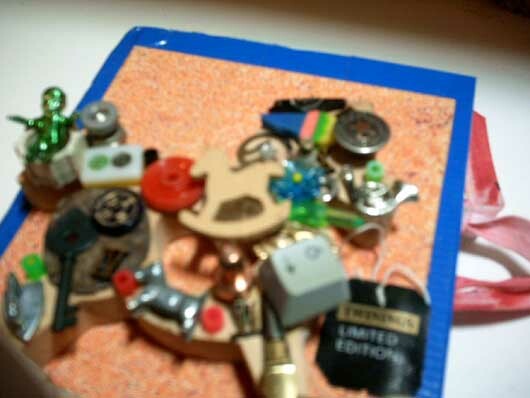 That was why I chose it for this cover, along with a copper nameplate I stamped with the word "Coffee." If and when I choose to create more altered pages in this book, the cover won't get in the way. Some of you may have seen not just the cover, but the interior of my Time AB. This was the first time I sewed a cover to a book. The clock was foam and from a children's toy department at a local discount store. The central image was bright yellow and the heart, which can be removed, was bright red. It's amazing what one can do with a bit of paint and glaze. This is probably my favorite AB cover. It may have been because it was my first time sewing fabric for an AB, or it may have been the collage I created. 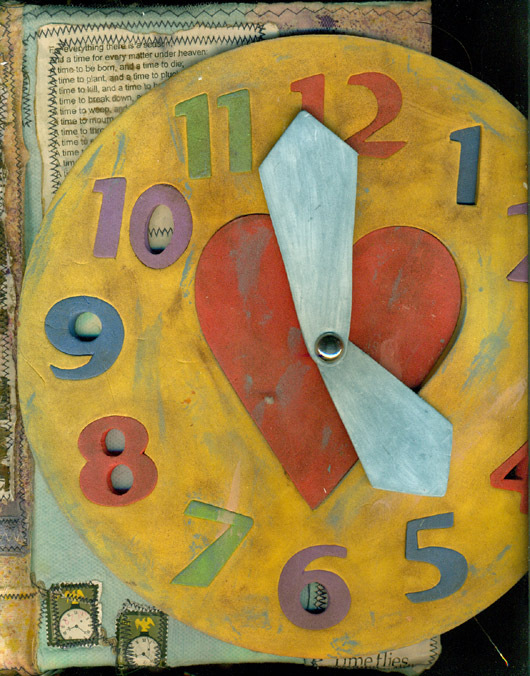 I used fabric, paper images, even clock hands to create this cover. The one thing I must caution against is when I ironed the cover to the book, I forgot I had embossed the words TIME, TIME, TIME before I sewed it in the spine area. The embossing turned to mush as I ironed the piece in place. This may be my favorite AB, because I took an imaginary trip through about 40 countries in Asia. I learned as much about the history and culture of various Asian countries as I did about collage. I hope to scan the inside pages again soon. My art friend Kathy's husband cut two ABs in this shape, and she gave me one. It was hard to work in it because of the shape. The worst times were when I started with background paper that had to be cut to fit the page. In true Asian style, the "back" cover of the book was decorated to be the "front." For my "Money" AB, which you can see all the inside pages here, I covered it with a very stretchy and unruly tee shirt, then added a polymer clay title. 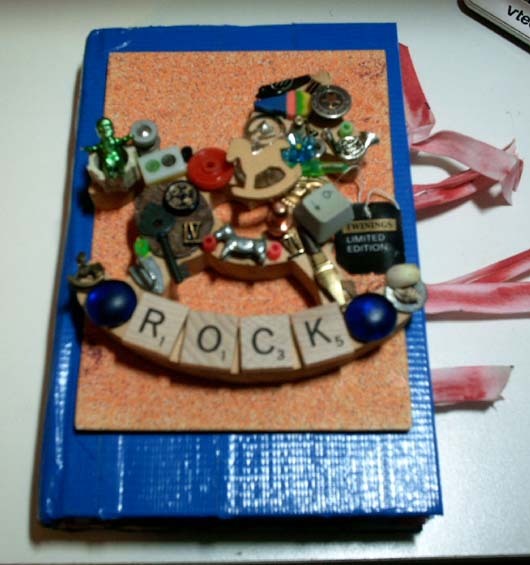 It seems the polymer clay piece I made for the front of the AB has broken, although it is still intact in this photo.The name of the book was "The Fortune," so I left the title intact. This is actually one of my favorite ABs. Those of you who are/were Buffy fans will appreciate the fact I found a Buffy doll to grace the cover of this AB. I didn't do much else to cover the outside, though, especially since I left the title intact. I loved the name of the book "Daughter of Darkness." It felt like the right book for altering it into both a Buffy and Angel AB. Note that "Mr. Pointy was made of polymer clay, something I seem to use a lot on the covers of my ABs. This was a tip-in* book using the book title "Full Circle." The right side has games and game pieces tip-ins, while the left side was flipped upside down (as were all the tip-ins associated with the Oxymoron swap). Note the Bride/Groom game pieces I used on the right. Several oxymoron tip-ins used that exact same concept (bridegroom). It truly was a full circle book. 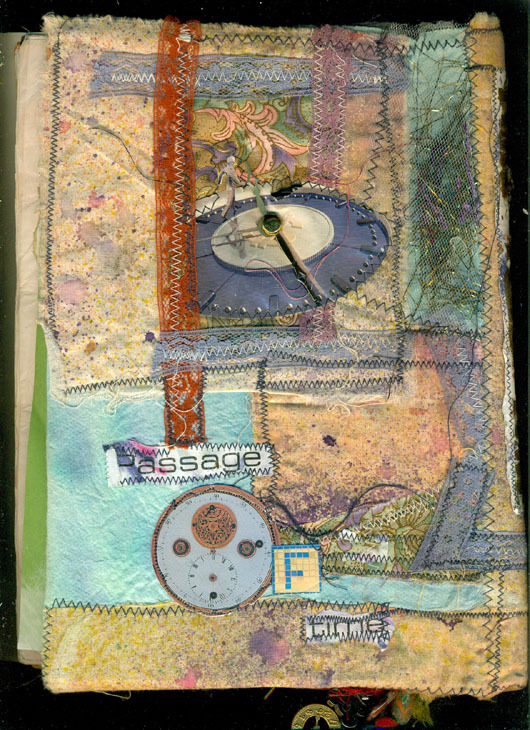 *A tip-in is a page decorated on both sides that is added to an altered book. It is usually placed/glued between two consecutive pages that have been cut to within a 1/2 inch or so of the spine. For my rocking horse AB, I wanted to continue to keep it as flat as possible, because I have not yet finished this book. Originally, I had planned a different cover and embellishment, but changed my mind when I didn't have time to finish my AB in time to create the cover. So, for this one, I chose some beautiful blue duct tape and a canvas I covered with some hand painted/spritzed paper. Then I grabbed the rocking horse that sat on my main floor craft room table for many, many months before I decided to change it with the one Tertia sent me from South Africa. In the end, I went back to my original rocking horse, though. I blame it on Rebeca Trevino, whose blog is Obtainium Art. 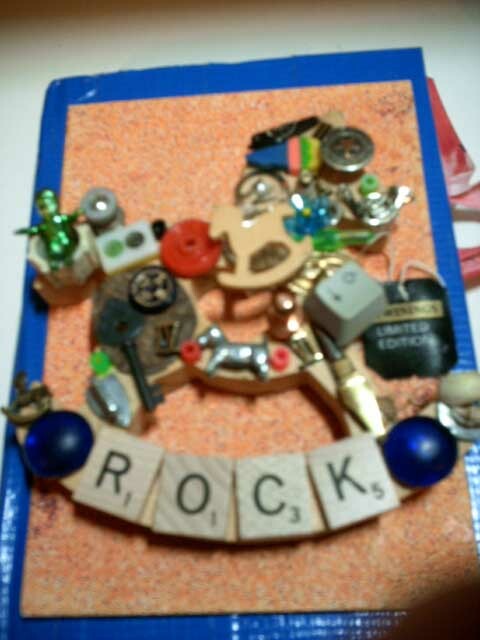 She recently posted a carousel horse she altered using found objects. Her horse impressed me so much, I knew I had to try my hand at covering my rocking horse the same way. I realize the photos are HORRIBLE, because my camera is lousy, but I hope you get an idea of everything I used. After covering the AB in duct tape, I added small pieces that either had meaning to me, or that fit the empty spaces. I know you can't really see the pieces very well. I wish I could scan this rocking horse, but that isn't possible because of the different heights of the pieces I used to alter it. nothing was truly legible. And yes, that's a tea bag string and label in the horse's mouth. In the end, I removed the covered canvas backing to which I attached the rocking horse. I will attach it once the AB is finished. I spent so much time altering the rocking horse, I wasn't able to finish my Houses techniques AB. 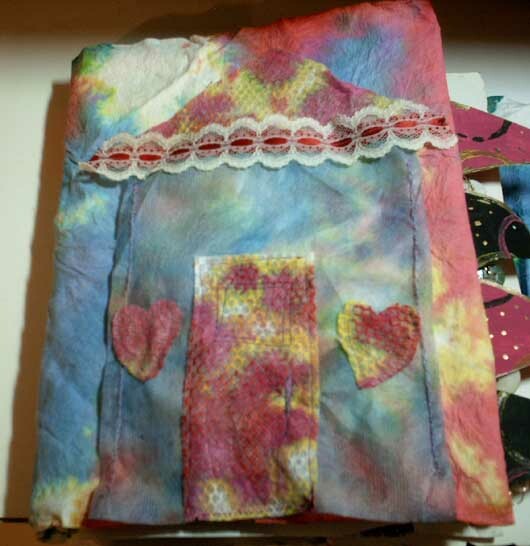 Since it is also not finished, I opted to sew a house together using dyed wet wipes. I plan to sew it to the cover, fabric that was also hand dyed. I learned my lesson about trying to iron wet wipes because they melt, so I know I can't fuse them to the background fabric. You can see how this will fit, though. I had intended to show how to add fabric or paper to your AB, but again, time constraints (and holiday guests who are still here because it is still Saturday in my world) prevented that. However, let me walk you through the process, although I have no photos. 1. Measure the total width of your book (front, back, and spine). Measure the length. Add 1/2 inch to both measurements. 2. Cut your fabric or paper to size. 3. If using fabric, fuse the fabric to fusible webbing, but leave the backing intact. 4. 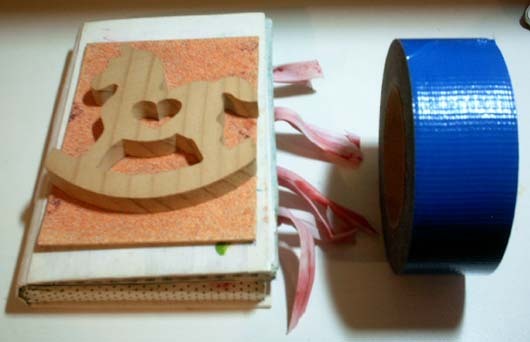 If using paper, choose your favorite glue or tape. 6. Position the fabric or paper on the cover, being sure that each side has 1/4 inch overlap. Be very careful here, because you must measure accurately. 7. Iron the portion of the fusible web you have removed to the book cover. When cool, remove the rest of the backing, making sure you have not moved the fabric out of position. 8. Glue paper as in #7 above. In fact, if you have fusible webbing, I suggest using it for paper, too. 9. Finish gluing or fusing your paper or fabric to the outside of your AB. Be careful to press your iron into the creases along the spine. 10. Cut a 45 degree notch in each corner of your overlap. This is to ensure the paper or fabric fits well and does not bunch or overlap. Do NOT cut all the way to the edge of the book, but leave a small amount of fabric or paper for the slack or overlap. 11. Iron or glue your fabric or paper to the inside cover of your AB, being careful to match all the edges. You must be careful because you have already decorated both inside covers. Instead of doing a lot of measuring and gluing/fusing, you can always paint your AB cover (be sure to protect your inside covers with wax paper or Press and Seal). Add a great embellishment, and call your AB complete. You have two weeks to complete your AB cover, at which time I will ask for your link (although I may not be able to see it unless I use my translator). Do you have additional photos or pages in your AB you would like to share? If so, please create an AB wrap-up post, showing what you have learned in this class. Use as many examples as you like. Please add your link below. This is Day 25 of AEDM, and is the final AB lesson. I'm not sure this is going to work, but here goes the link, anyway. If it doesn't work, please leave your link to your wrap-up post in a comment. In fact, if I can't see your links, it might be best to do that anyway. that is so sweet! 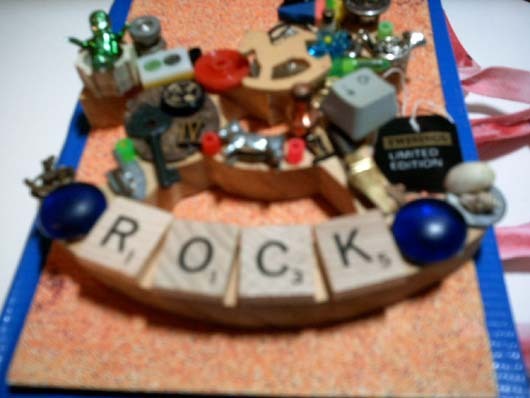 "Rock" rocks! i think he will be a perfect embellishment for your AB cover. When I came to read your blog, I had forgotten that it was Sunday. I feel a little sad that it is over, too, but so,so grateful to you for all I learned and so, so proud of myself~ After seeing all of these totally awesome covers, it may take me the two weeks to decide what I want to do. What an impressive array of altered books! These covers are just gorgeous. I do love your sewn covers, but the altered rocking horse cover is really amazing too. all those little bits and pieces...you know how I enjoy that. Hope you've enjoyed your 'company' and are staying warm and cozy. Awesome work, and very generous information. It's a delight to learn so much from you. I'm adding my, sniff, last link to my recap. ;^) Thanks, Elizabeth. Elizabeth thank you so much for taking us all on this wonderful journey. Things have been so busy for me here I am very far behind now. Hopefully I will have it finished by Christmas, my original goal. You have taught us all so much and I have enjoyed your inspirational examples. Your book covers look fabulous! Wishing you a very happy holiday.